THE COURTYARD HAS BEEN TENTED! THE SHOW GOES ON RAIN OR SHINE! RSVPs CLOSE AT 5PM TODAY. AFTER THAT YOU WILL NEED TO REGISTER AT THE DOOR. * Due to the high number of RSVPs, we recommend prompt arrival at 6:00pm. * Space is limited, admittance and cocktail tasting will be first come, first served, with preference given to those who have RSVPed. * Please consider making a donation to support local artists. * RSVP does not include admission to Spectrum. To purchase Spectrum Tickets, Click Here. 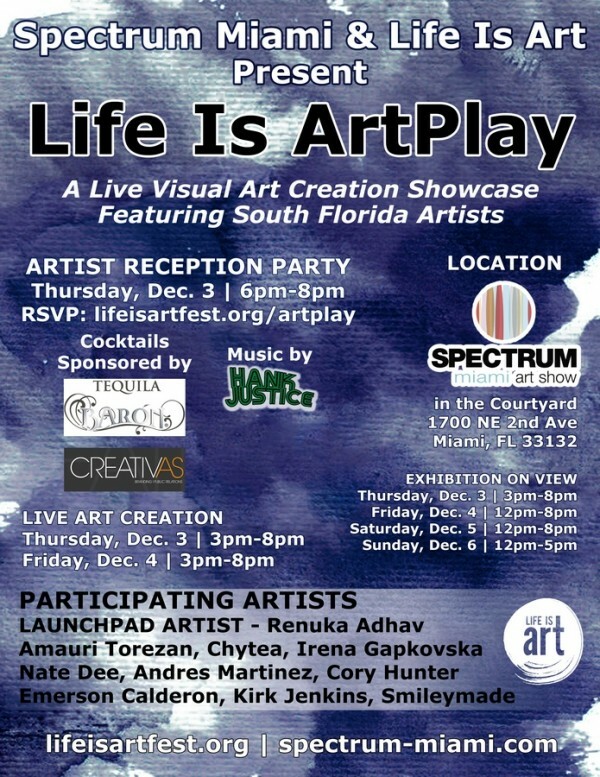 Watch art come alive during Artplay, as Life Is Art’s specially chosen group of artists create their next masterpiece right in front of the crowds at Spectrum Miami. Inspired by Spectrum’s [EMERGENCE] theme, the artists will offer a glimpse into how each piece of art uniquely emerges, giving light to the artist’s creativity and medium. For tickets to Spectrum Miami, please click here. Spectrum Miami, a juried, contemporary art show fixed in the heart of the Performing Arts District, takes place annually in December (Dec. 2-6, 2015) as part of the popular Miami Art Week. Spectrum Miami celebrates the fine art experience with five days of music, entertainment, and other special events. Spectrum Miami has emerged as one of the best-attended cultural events in Miami by highlighting thousands of innovative works among Miami’s top talent. The theme for Spectrum Miami 2015 is [EMERGENCE]—Innovative Vision Coming to Life. Spectrum Miami features specially curated programs that are informed by the theme, including site-specific projects, art talks, and panel discussions; a selection of dynamic and cutting-edge film, video, and new media works; and a curated selection of emerging and spotlight artists. These programs provide a dynamic experience for attendees, allowing them to view and interact with works by leading international artists, experience the work of those artists outside of museum walls, and enjoy exhibitions that showcase the thriving art landscape of Miami. This year the special exhibition is ARTE Cuba. Curated by Stacy Conde, an established gallerist specializing in Cuban art, ARTE Cuba will present a carefully curated group of Cuban modern, contemporary, and cutting-edge art represented by galleries, art dealers, and the artists themselves. She is excited to bring Cuban art and artists into the spotlight during this exciting time of change between the United States and Cuba. Spectrum Miami, a juried contemporary art show, taking place Wednesday, December 2 to Sunday, December 6 during Miami Art Week, moves to a new location (1700 NE 2nd Ave., Miami, FL 33132), in Miami’s Performing Arts District, co-locating with Red Dot Art Fair. As part of Redwood Media Group, Spectrum Miami is more than an art show—it’s a five-day fine art experience featuring top galleries and artists from across the U.S. and around the world, along with live performances, curated projects, and late night parties. STATEMENT: This work explores the contradiction of illusion and perception of reality. Various mediums are made to interact with one another causing landscape and environment formations. These alchemical discoveries provide a glimpse of a place that feels alien, yet intimate. BIOGRAPHY: Renuka Adhav received her A.S. degree in Radiography and Certificate in Nuclear Medicine Technology from Florida Adventist University in 2009. For two years she worked as a Nuclear Medicine Technologist while also teaching art classes in Jacksonville, Florida. In 2012, Renuka moved to Atlanta to pursue a BFA in Painting, realizing that her passion for art was something she wanted to seek further. She mainly works with oil, but enjoys experimenting with various materials and media. Her work was featured in Fahm Gallery, Ferrari Fine Art Gallery, Ga and Moxie Interactive, all located in Georgia. Renuka received her BFA in Painting and is currently working and living in Miami. STATEMENT: My work explores the evocative interrelation between color and form to create an aesthetic experience that engages the sight, sounds, and emotions of the public. Creating artwork that combine geometric and organic shapes , I look to distribute cool and warm colors in a way that they share the same areas, making the paintings balanced, and interesting to the eyes. My intention is to bring these pleasant feelings to the audience, and have each individual interpretation and enjoyment being based by its own perception. My influences range from the pioneers of abstract art to the Brazilian modernists, not only visual artists but also architects and landscape designers such as Oscar Niemeyer and Roberto Burle Marx . What brought me to create this type of work was its sense of improvisation, high energy, and an emphasis on the painting process . Instead of using paint to carry out a visual idea, I am thrilled to discover the visual idea through the process of creating it. Torezan is a Brazilian born artist currently based in South Florida. Influenced by the work of the pioneers of abstract modern art, Torezan developed his unique style creating hard-edged compositions flatly painted on a variety of backgrounds. In his paintings, geometric and organic forms seem to be floating around each other evoking a sense of depth as though the shapes were eternally suspended in space. The strongly contrasting colors enhance the dramatic and exuberant effect creating an overall sensation of blossoming and burgeoning life. BIOGRAPHY: Born in 1975 in Rockville Connecticut. Chy Walton is an emerging artist in Miami and has involved himself with many mediums of art. Acrylic, spray paint being his favorite. BIOGRAPHY: Irena earned her Masters Degree in Graphic Art from St. Kyril Methodiy University Fine Art Academy in Skopje, Macedonia, with her thesis on Symbolism in Art. In 1998 Irena founded NGO Art Studio, a non-governmental (not-for-profit) open art studio in Skopje. In 2010, Irena established her studio at the Bakehouse Art Complex in Miami, Florida. In 2014, Irena was appointed as Cultural Attache to the Honorary Consulate from Macedonia to South Florida. STATEMENT: My masked series examines the use of animals and zoomorphic iconography from various cultures. For many past and contemporary societies, animals have various connotations whether religious, spiritual, or their images have been used to embody certain personality traits. In other cases as found in (i.e. European) literature they can be represented as a guides, protectors, antagonists, ethereal, and even demonic. STATEMENT: In a search for new methods to ‘read the city’, Martinez seduces the viewer into a world of ongoing equilibrium and the interval that articulates the stream of daily events. Moments are depicted that only exist to punctuate the human drama in order to clarify our existence and to find poetic meaning in everyday life. His media artworks are often about contact with architecture and basic living elements. Energy (heat, light, and water), space and landscape are examined in less obvious ways and sometimes developed in absurd ways. By parodying mass media by exaggerating certain formal aspects inherent to our contemporary society, he makes works that can be seen as self-portraits. Sometimes they appear idiosyncratic and quirky, at other times; they seem typical by-products of American superabundance and marketing. His works sometimes radiate a cold and latent violence. At times, disconcerting beauty emerges. The inherent visual seductiveness, along with the conciseness of the exhibitions, further complicates the reception of their manifold layers of meaning. By emphasizing aesthetics, he focuses on the idea of ‘public space’ and more specifically on spaces where anyone can do anything at any given moment: the non-private space, the non-privately owned space, space that is economically uninteresting. BIOGRAPHY: I was born in Hialeah, Florida in 1983. A decedent of Caribbean and South American immigrants who settled in Miami in the 1980’s during “El Mariel”. I Attended School of Visual Arts in New York City, received my bachelors in Studio Art in 2007. After a couple years travelling I returned home with a new found desire to grow with Miami as one of its artists. I create series of works that are saturated with obviousness, mental inertia, clichés and bad jokes. The work reflects my mixed heritage and questions the profound meaning and superficial aesthetic appearance of everyday images. STATEMENT: Cory Hunter is an Artist from Miami Florida who works at the intersection of art and science. Using high-voltage electricity as his preferred medium, he weaves intricate burn patterns into unique pieces of art, pushing the boundaries of artistic expression and scientific experimentation. Whether with his characteristic gouache abstract blossom paintings, or more figurative work, the interplay of artistic intention and the artfulness of nature weight heavily in each painting, calling to question the essential link between these two disparate fields. BIOGRAPHY: Cory Hunter was born and raised in Miami, Florida. For the past 6 years he has been exhibiting paintings and performing live demonstrations of his high-voltage burning technique. He received his first degree, a bachelors of arts at the University of Florida, where he studied non-western art history and sustainability. He is currently an electrical engineering major at Florida International University. STATEMENT: I am a representational painter. I paint life as I interpret it. The skills and discipline required for this style is what attracts me to it. The contemplation and examination of surroundings and the understanding of light, form, shape, and color in every object is a form of meditation. In an age of instant gratification and multitasking, this form of art not only requires the time to execute it, but also demands the passion, commitment and patience to render high quality pieces of art while celebrating skill and craftsmanship in a time where conceptualism is dominant. My paintings are the result of the most pure form of abstract that anyone could imagine. I don’t just copy what I see, but rather carefully deconstruct reality to the most basic forms in order to create the illusion of reality. No one will see or render art in the same way because people experience life differently. After all, we see reality through our own filter and we interpret it based on our own personal narrative. BIOGRAPHY: Emerson Calderon is a contemporary representational painter . He received his illustration Degree from the Instituto de Diseño de Caracas in 1996, and studied the traditional atelier methods of drawing and painting at the Romero Hildalgo Artist’s Studios in Miami, FL. His paintings are predominantly oil on canvas, but he also works in watercolor and charcoal. Calderon’s figurative and landscape works are identifiable for his expressive brush work and bold strokes. STATEMENT: I don’t paint pretty pictures to be propped up on a pedal stool. I paint my truth and what it is I’m going through. BIOGRAPHY: From The street to the studio – Kirk has retained his uninhibited, childlike instinct and imagination. Refusing to be confined by social, political and religious views and expectations.Through his unique symbolistic approach. crude, primitive purity that is at our essence. His works have been shown and exhibited In Los Angeles, London and his birth place Australia. STATEMENT: Have never really been given a chance to display my art. Wiuld love to be a part of this event. BIOGRAPHY: Ive never tooken a art class everything i paint is from living emotions and life. Im a local artist from miami florida. I definitely feel that my paintings express who i am and what i think about.